One of the most important events for the local spinning and weaving community, to say nothing of the farmers and the wool industry, is the annual Australian Sheep and Wool Show, held in Bendigo towards the end of July each year. It’s like an agricultural show or a county fair but just concentrates on everything to do with sheep, and a few alpacas and other fibre animals included for good measure. For everyone involved in creating textiles there are competitions, and opportunities to top up the stash from the vendors and to actually touch equipment from interstate suppliers. For the producers there are fleece and meat competitions, ram sales and displays of all sorts of farm equipment – I wonder what a lot of it does. It’s held at the Prince of Wales Showgrounds in Bendigo, guaranteed to be freezing cold in the middle of winter. Preparation for a visit starts with important decisions about warm and very comfortable footwear as well as the number of layers. Actually preparation should start well before this when the Woolcraft competition schedule arrives in the mail. There’s the will I/won’t I enter debate and if the answer is ‘yes’, then which classes. I had several metres of hand woven fabric just asking to be made into a garment so ‘Handwoven garment’ was definitely a possibility. Entries were due about the same time as the bad cold I had recently, the one where I wasn’t even interested in lifting a shuttle. I assumed that eventually I’d be lifting a shuttle again, added ‘Handwoven article’ to the entry form and sent it off. I had an idea for a double weave scarf but couldn’t quite work out the details, so I settled for 8 shaft Summer and Winter. 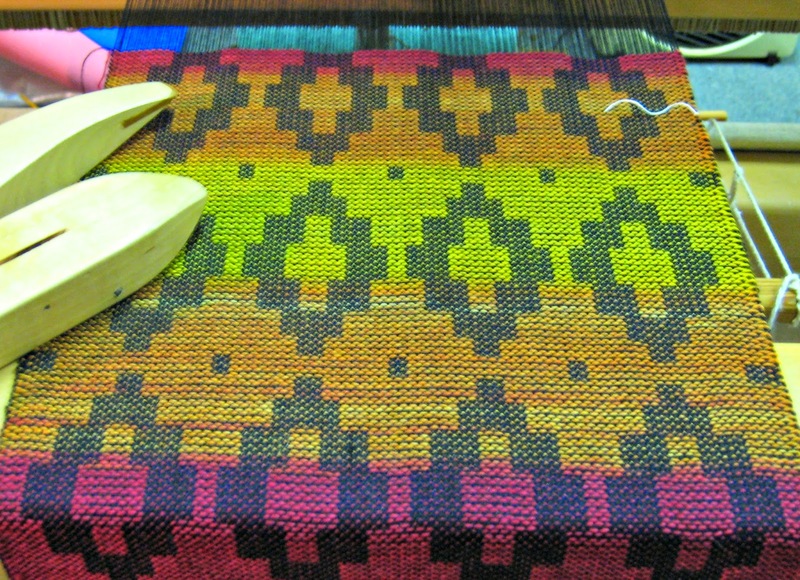 I had plenty of black 2/22 wool for the warp and tabby weft and fancied a dyed weft with long repeats. I’ve seen the blanks for dyeing knitted on knitting machines, but as I don’t have access to a knitting machine, decided it should work with a mechanical knitting nancy which I do have. I did the maths, worked out that I would need around 50 gm of yarn made into 30 metres of knitted cord and started knitting. It gets quite twisted in long lengths so I ended up knitting on the upstairs landing and letting the cord fall into the stairwell to untwist. Then I set up the laundry for dyeing, and dyed the knitted cord. Each section of colour wove about 3 inches of the scarf and the pattern repeats were about 4 inches, I even managed to get both ends of the scarf to match. The changes of colour weren’t quite as gradual as I had planned but it still worked well. I’m providing a home for a friend’s slightly larger but not full sized knitting machine while she moves house, I’m hoping that it will make better blanks. 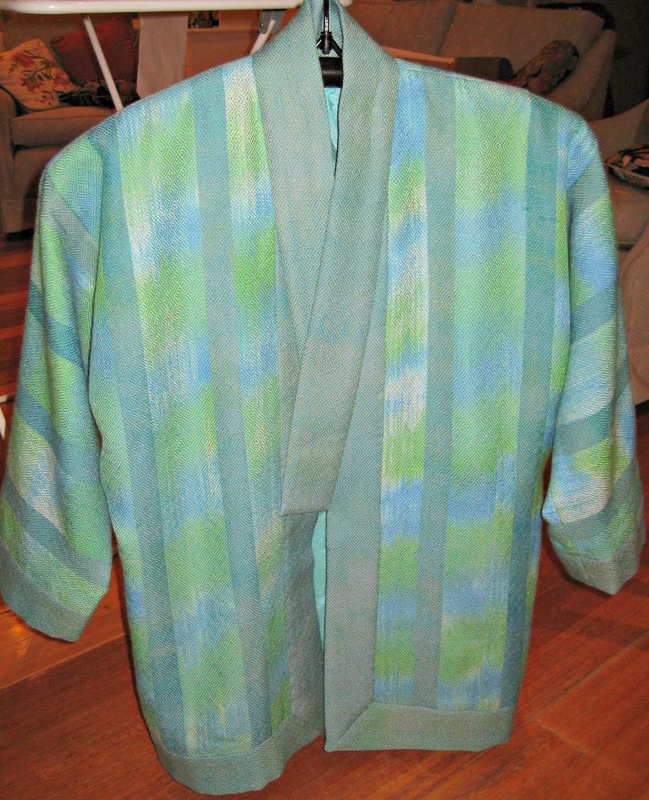 For the ‘garment’ I used the green fabric from an earlier post, something that had languished on the loom for months. I fancied something with a Japanese flavour and settled on a hanten with a kimono collar, drafted the pattern with Garment Designer. At the start I wasn’t quite sure how I would finish the edges but it all fell into place with a wide mitred band around the fronts and lower edge and a matching edge on the sleeves. I attached the lining around the back neck and along the inside of the front bands and used the kimono collar to cover the raw edges. The fabric was a little bit fragile for tailoring as I found out when I joined the first 2 seams together and then tried, unsuccessfully to serge the edges. After that I serged first and then joined the seams without any further dramas. I was pretty happy with the end result but there was no time for proper photography, just a quick press and I delivered it to a friend who was able to deliver it to Bendigo. As well as the Sheep Show I’m spending Saturday night with an old family friend who lives nearby and if there’s time on Sunday I’ll try to get to the exhibition which is opening on Saturday at the Bendigo Art Gallery – Undressed: 350 years of underwear in fashion, including I believe a pair of Queen Victoria’s knickers. It should be an interesting weekend.